Queens Park Rangers have confirmed Christopher Samba will re-join Anzhi Makhachkala, with a club-record transfer fee reportedly agreed upon. Samba arrived in West London from the Russian club following a transfer deadline-day deal in January, but failed to prevent Harry Redknapp’s side being relegated. And with Redknapp now preparing for life in the second-tier, Samba – who had signed a four-and-a-half-year deal – has been allowed to return to Anzhi. 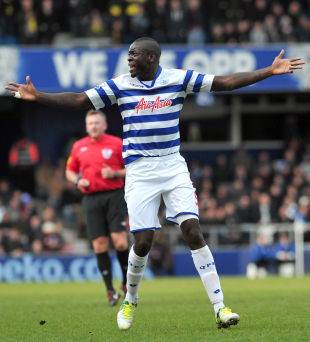 “Christopher Samba has today re-joined Anzhi Makhachkala for a club record undisclosed fee,” a QPR statement read. “Samba returns to the Russian club after a brief spell at Loftus Road, which saw him make 10 appearances in the Premier League. Samba endured a torrid, if brief, time at QPR after Anzhi claimed he had been offered the same £100,000-a-week wages that he had been on in Russia. Anzhi director German Tkachenko said he thought QPR had “lost their minds” when they tendered a deal they alleged was worth £12.5 million.